To scratch an itch or cure some ills, sometimes a dose of high-energy, vividly-produced power pop is just what’s called for. Sure, there’s no shortage of the style to take care of these needs, but if one’s also seeking a taste of the new, then one should look no further than the self-released latest by the Seattle supergroup Stag. Beefed-up, hooky, unabashedly hi-fi as produced at Hoboken’s Water Music by John Agnello, and sporting a cover photo of pure inspired excellence, Midtown Sizzler is out now on compact disc and digital. The bigness of Stag’s sound can frankly be a little disconcerting to ears inundated by muffled, grizzled, or generally more contained aural climes. But befitting the dude getting down on its cover, Midtown Sizzler is intended to burst out of speakers, to elevate gatherings, and make car rides something more than just a trip between two points. And given the experience of Stag’s membership, it’s quite likely their live show goes down a storm. Who’s in this band? Well, Steve Mack, formerly of That Petrol Emotion is on vocals, for starters. There’s also Ben London of Alcohol Funnycar and Sanford Arms on guitar and backing vox, John Randolph of The Cops on guitar, Pete Everett of Tuffy and The Mellors on bass, and Rob Dent of Jackie on Acid and Sanford Arms on drums. If one persists in thinking Stag comes on too strong, the way they extend a complementary batch of influences, namely pre-operatic Who, Badfinger, pre-Third Big Star, ’70s power pop in general, Cheap Trick, and even Guided by Voices, will be the make-or-break element in the scenario; rather than strive for a classicist or reverent vibe, the band wraps their loves up into a package that’s solidly contempo, at least within the guitar pop template. This is immediately apparent in the hooky, radio/ playlist friendly punch of “Pharaoh,” though the band’s emphasis on the left side of hyphen in power-pop asserts itself just as quickly. This is a melodic situation, but it also possesses heaviness (a factor magnified by ample washes of guitar), which surely relates to John Agnello (who’s produced Dinosaur Jr. amongst others) being brought on board. Maybe it just the electric piano flourishes throughout “Come On,” but the song really wafts some Faces-esque fumes. More specifically, it’s reminiscent of a well-loved regional act with long-internalized Faces-style swagger reformulated into tunes they spat back out on weekends in clubs and with any luck onto a record or two. London wrote all the songs here, and this knowledge lends a slight auteur touch to a sturdily band-ish endeavor, the hometown roots of which are magnified by two tracks being recorded by Jack Endino. 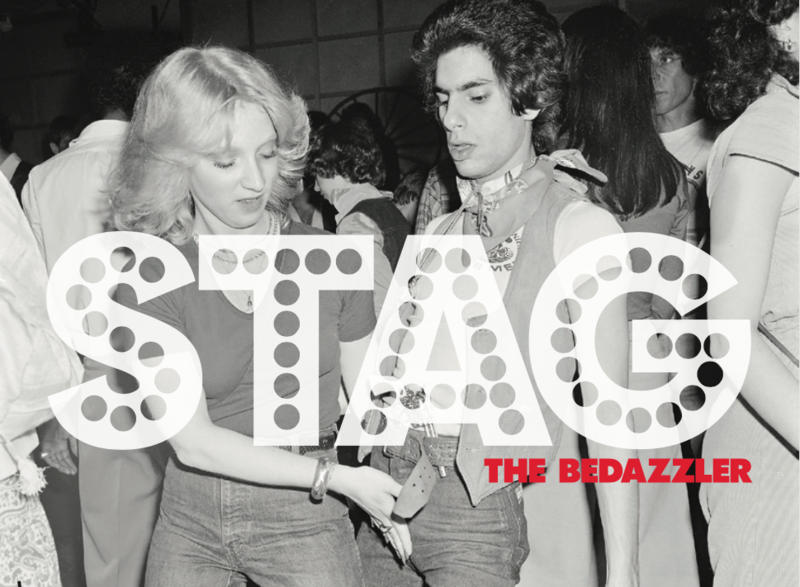 Instead of the grunge that Endino helped shape as a knob-twiddler (and as member of Skin Yard), “Bedazzler” gets infused with horns, the song aptly assessed as a glam-rock strut with strategic sustained outbursts and a wicked guitar solo. Again, this is not for all tastes, but for anyone contemplating dressing up as Marc Bolan this Halloween, “Bedazzler” should land right in the zone. “Rosemarie” scales things back just a bit, connecting like a mix of Bomp!-era anthemic charging and GBV during their TVT period, and “Runner,” the disc’s other Endino-recorded cut, emerges as a simple vessel of hooks, not unlike the A-side to some self-recorded cult 45, only to eventually soar in the manner of those early ’80s power-pop tracks that somehow managed to get absorbed by commercial radio. This retention of the basic root spark and then choosing to go bold is ultimately the recipe to Stag’s success, though the splendid “Figure You Out” does lean toward the classic power-pop paradigm. It sets up a sort of bait and switch maneuver, as “Pictures” opens with a plunge into piano-driven, lighters-aloft Cheap Trick-ian balladry, or alternately, mid-’70s pomp-rock, though it thankfully conjures up enough Badfinger-like gusto in its midsection to keep matters moving. For the finale to this too brief full-length, “Already Know” leans a smidge too close to ’90s Brit Alt action of a vaguely Stonesy stripe, which is no great crime, but a knockout is what’s called for, and along with “Pictures,” it does chalk up Midtown Sizzler as a shade less than outstanding. But these are minor hiccups in Stag’s surprisingly persuasive melodic rock designs, as there are outstanding moments. For a good time one need look no further.